I already wrote about the HUB-Berlin on this Blog, but as I want this personal Blog to be about the ideas that drive me, I want to add another important topic: Social Business. And starting with a very basic question: What is this? Imagine a bridge that is needed in a very poor, underdeveloped place. A bridge, that is extremely necessary for the rural population to transport goods and earn a living. How can you run this? Old way: An investor builds it, runs it, makes profits through the toll, wants to make more and more profits. Or the investor brings the money to a different place. This is the old way. The new way, it’ s Social Business: The ownership of the bridge is given in the hands of the actual population in the form of shares. Micro-credits can make it affordable to poorer people. Money made out of the bridge-tolls will be reinvested; either in similar projects or a higer share-value can be realized and it definitely goes to people that need it. I wrote: The ownership is given. But who gives it into the hands of people that really need it? A company that is founded by a passionate person (e.g. Yunus), but also makes sure, that ordinary people can own shares, that need the services of the company and also are willing to contribute to the company in more than a material sense. Investors should have an emotional association, more than the abstract worth of the share. And here we are in Berlin, in the HUB Berlin. It is a cooperative, run by the self eG, shares are mainly owned by people who are either experienced in projects/initiatives that are not neccessarily Social Business, but new and creative. And these people also want to be sorrounded by people that think about making the world a better place in an entrepreneurial sense or in a private sense (LOHAS – Lifestyle of Health and Sustainability). This is the difference of sitting with a Notebook in Starbucks and pretending to work. As it is with the bridge, which seems to be a totally different example: People can invest money and their ideas (look at the HUB’s events on the Blog) and earn later on in a material as well as immaterial sense (There is nothing more worth than seeing positive change in your immediate environment!). With about 40 participants on the “Social Business” dialogue evening in the HUB, the self eG proved its power to bring together people from various fields. 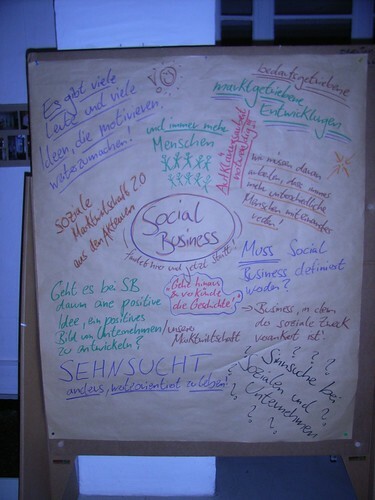 Norbert Kunz and Ralf Weiß introduced the topic “Social Business” with their expertise. With iq-consult, Kunz enables young people to found their own business. 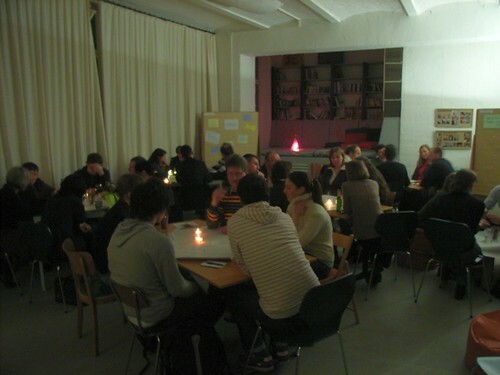 If anyone wants to hear abot the HUB Berlin life, come to Social Bar Hannover on 6 August. I think the Social Bar is also a HUB in its literal sense, because it offers almost no restraints on what you want to present or hear about, and is therefore very good to connect to people with ideas of any kind. Entry filed under: featuring:. Tags: HUB Berlin, Kreuzberg, Social Business, Sustainability, Web 2.0.